Health Care Renewal: Does EHR-Incited Upcoding (Also Known as "Fraud") Need Investigation by CMS, And Could it Explain HIT Irrational Exuberance? Does EHR-Incited Upcoding (Also Known as "Fraud") Need Investigation by CMS, And Could it Explain HIT Irrational Exuberance? It has long puzzled me why an experimental technology that costs tens or hundreds of billions of dollars to roll out organizationally and nationally, that individual medical centers are spending upwards of $100 million or more upon, and that has a track record as poor as suggested in posts such as "An Updated Reading List on Health IT" and "MAUDE and HIT Risks: Mother Mary, What in God's Name is Going on Here?" is so popular. ... I have written about health IT problems extensively on this blog and at my academic website on HIT failure. These include but are not limited to: medical informatics specialists ignored by nonclinician IT personnel [the link is to another case involving critical care]; inverted and paradoxical organizational structures where IT facilitators become HIT project leaders and clinical leaders become HIT project facilitators; ill-conceived and poorly implemented mission hostile health IT; perverse and in fact clinically cavalier IT "politics"; failure to obtain patient informed consent as if health IT is an elite world not subject to the same ethical obligations as medicine; probable violations of Joint Commission safety standards and hospital executive fiduciary obligations, and numerous others. ... On top of an irrational exuberance (see this blog query) largely unsupported by the literature (e.g. here), the technology is experimental, its rollout is a grand national experiment in social re-engineering of medicine, there is no patient informed consent, nobody is in control, and nobody is taking responsibility for regulating the domain despite known risks. The results will very likely reflect the Wild West free-for-all that is now extant. Finally, at a Feb. 2011 post "An Updated Reading List on Health IT" I aggregated recent literature that sheds significant doubts on health IT beneficence. Is the popularity of health IT as it exists in 2011 a paradox, or not? When I was dealing with public employees in a transit authority several decades ago, I learned that mysterious circumstances and paradoxes were not paradoxes at all. The assumptions were simply wrong. Often, mysterious circumstances proved to be related to money (as in worker's comp fraud) and/or money related to [illegal] drugs. Below are some charts and data from a HC Renewal reader, an ED physician, that may answer the mystery of the "irrational exuberance" exhibited by healthcare organizations towards clearly disruptive, medically risky and liability-provoking experimental technology. This is especially so in high risk areas such as an ED. It should be noted that my recommendations as a CMIO a number of years ago in a very large regional medical center were that an ED would benefit best clinically from paper charts supplemented by document imaging, so that images of past charts could be instantly retrieved. 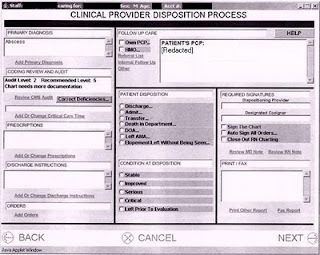 ED's are busy places where clinicians have little time for distractions (such as computer data entry), but where access to past charts can be important. ED charts are also not generally very long or complex documents. Further, document imaging is a mature technology (e.g., Documentum). Those ED recommendations still stand. Note that the data and charts below are estimates only, pointing to a potentially huge problem -- with computer-assisted Medicare fraud implications -- if the projections are reasonable. 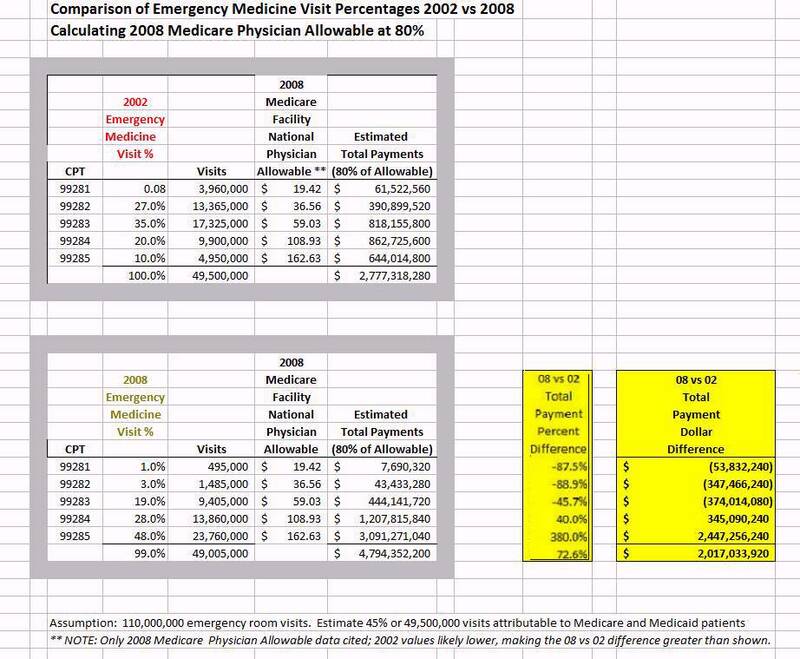 This appears to indicate a great increase in upper level (level 4 and 5) billings from 2002 to 2008 in ED's with increasing advent of EHR (part of this is likely due to "paper template" charting). 99283 - level 3 - limited focus history & physical exam performed, e.g. physisian evaluation with additional tests such as an x-ray. Apparently Shoemaker and Ford were able to get CMS data for 2002 and 2004 and draw the conclusions that while some hospitals and ER groups were undercoding, there was a significant level of upcoding occurring. 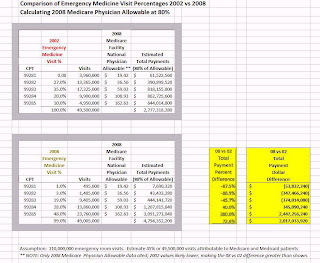 Note that the above projections assume the same Medicare physician allowables for 2002 and 2008; lesser values in 2002 (compared to 2008) would push the 2008 payment increases upward. 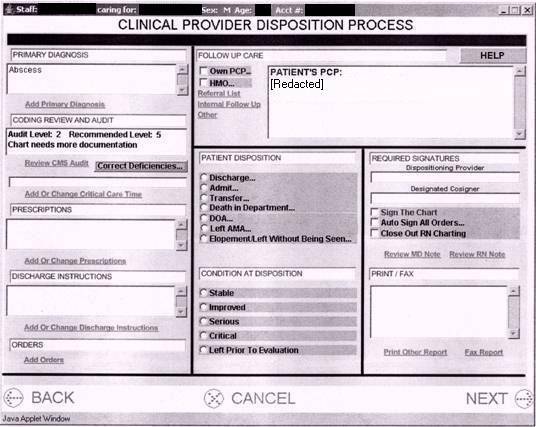 Finally, some actual ED screens from a major HIT vendor, McKesson, that "encourage" physicians to upcode. The "coding engine" of this ED EHR system produces "recommendations" for "additional documentation" to support a higher level of coding. Such incentives themselves might be legitimate, but can create moral hazard - and the means, motive and opportunity for "playing with the coding a little bit" - if physicians' coding levels are monitored by their organizations. 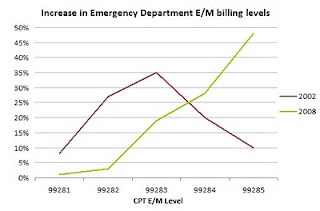 It should be remembered that increased ED coding levels by ED groups, often contractors to hospitals, may permit hospitals to increase their own billing charges for services rendered to the ED patients. With little solid evidence of major clinical benefit, ED physicians seem to be paradoxically "asked" to utilize distracting, often mission hostile, even hateful ED EHR systems that many despise, even in face of the critical nature of an ED environment and increased risks and liabilities that can occur with distractions such as data entry. This is a seeming paradox. 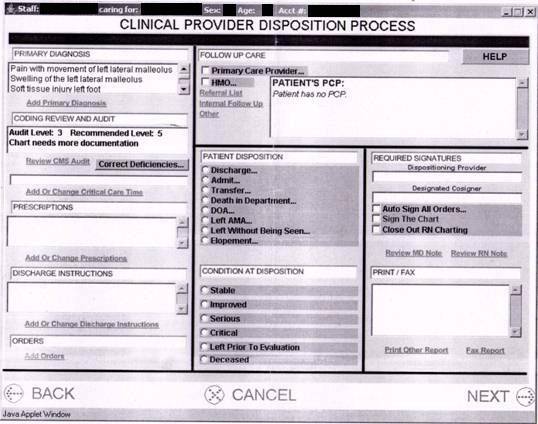 The ED physicians, after automated coding algorithms analyze the clinical data entered, may be "reminded" that if they fill in a few more details, the visit might be significantly upcoded. Payers such as CMS have little or no way to ascertain the veracity of the additional entered information that may result. Claims of purported savings from health IT that we hear about from pundits and government officials being a rather pathetic joke. Perhaps CMS (and other payers as well) could perform the needed rigorous investigation using their data and resources, to either confirm or disprove these findings. That's what we, the taxpayer, pay the government for. EHR facilitated upcoding is widespread. i am regularly reading 5 page progress notes that were electronically signed by the attending, but cobbled together by scribes, students, paraprofessionals, and if lucky, housestaff...and billed at the max. This, unto itself, is dangerous to care via the "where's waldo" phenomena. I do not blame the doctors. This is a natural unintended consequence of doctors being forced to waste their time entering meaningfully useless data using meaningfully user unfriendly devices, to satisfy arbitrary meaningful use grids. Someone has to pay for the professional time. Hmmm. Are lawyers not using billing exaggeration scales for postage, telephone calls, and letter writing? Actually, NO. It needs investigation by the FBI. The entire HIT industry needs investigation by the FBI. They should first check out LIEber and Leavitt, of the for profit non profits HIMSS and CCHIT for tax fraud. Next, they need to look at the conduct of the HHS secretaries, beginning in 2004. In my community we are watching the ever increasing push of hospitals into private practices. Often a practice is sold to a hospital in great part to overcome the IT requirements now in place. The Akron Beacon Journal has highlighted how private practices have been purchased, are then declared part of the hospital system, and then billings are increased for in office procedures. A side effect of this has been the increase in the number of patients being referred to the ER for testing. In stead of the doctor scheduling an x-ray or blood draw, patients are now told to stop by the ER and tell them what they want, and the doctor will call ahead. It really is not rocket science to figure out that by simply going through one door v. another the result will be a higher charge with no underlying increase in cost. All brought to you with the simple click of a mouse. Why would a doctor do this? Simple, the doctor is now a revenue point in the hospital system and his/her salary is dependent on generating X gross dollars. With that same click of a mouse the hospital can track all revenue generated both in terms of direct practice billings and referrals. Wonder why medical cost continues to rise, while hospital income and salaries are also rising? I have heard it before here "if it walks like a duck and talks like a duck, it is a duck." Of course this is true Scot, its nakedly obvious. But the floors and floors of lawyers at most hospital chains who employ this fradulent practice are there specifically to provide a defense. Look at who sits on the boards of the hospitals likely to employ fradulent tactics, lawyers, lawyers and more lawyers, most of which also have their firms supported by the hospital and who run with the lawyers turned politicians. Keep it coming Scot. You keep validating my decision.....I want no part of this....as long as the gov't has incentivized and the motivations to implement is money....I want no part.... God help the patients. Today we learn that as part of the health care reform the IRS is going to need to hire 81 new agents to audit tanning salons to assure their compliance with the new federal tax code at a cost of over $100M. The assumption is we cannot trust those folks. That must be a real hot bed of medical fraud to warrant that type of expenditure. Looks like the real big computers want a shot at this too .... I mean heck, if you can win at Jeopardy, you can most certainly figure out how to beat the E&M rules without the ethical constraint of being human. Do computers understand the difference between truth and untruth or is it all just a statistical confidence % issue? After trouncing "Jeopardy! 's" best and brightest, International Business Machines Corp.'s (IBM) Watson supercomputer is on to a new challenge--health-care. IBM said it has reached a research agreement with Nuance Communications Inc. (NUAN), a provider of speech-recognition technology, to "explore, develop and commercialize" the Watson computing system's advanced analytics capabilities in the health-care industry. Columbia University Medical Center and the University of Maryland School of Medicine will be providing their medical expertise and research. I had written on Watson and medicine here. Community Health Systems, Franklin, Tenn., received a subpoena from HHS' inspector general's office seeking documents related to emergency department processes and procedures at all of the company's hospitals, according to a securities filing. The subpoena was dated April 8 and was issued by the inspector general's Chicago office for an investigation into possible improper Medicare and Medicaid claims, according to the filing. 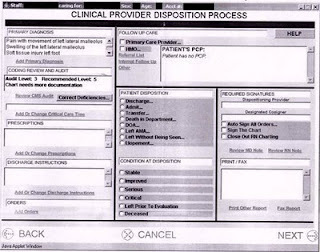 The subpoena requests documents related to Community's use of the Pro-MED clinical information system, a third-party software system used to manage and track emergency department operations, and its relationships with emergency department physicians, including financial arrangements, according to the filing. The requests are very similar to those made by the Texas attorney general's office in November regarding all of the company's hospitals in that state, according to the filing.